Not the most complex puzzle construction, but happy to present a setter’s blog nonetheless. As it happens, Raich is very familiar with French political developments, language and culture. When the number of French Presidents since the Fifth Republic was introduced in 1958 had reached six, it seemed a ‘critical mass’ might be there that a puzzle could be based around. The Fifth Republic introduced a new system with a directly elected President with very wide powers, with an election for President every seven years (this was later reduced to five) – maximum of two terms allowed. The Presidents are very well-known. The title of the puzzle suggested itself from a group of early C20 French composers known as that. My first thought was to put LES PRÉSIDENTS DE LA CINQUIÈME RÉPUBLIQUE within the grid in the shape of the perimeter of the map of France which solvers would have to find. In France this is known as “The Hexagon” after the geographical shape of the country. I would then try to build a puzzle involving the Presidents around it. The Hexagon might have given further opportunities to use the ‘six’ theme. Despite quite a few attempts I could not achieve this, trying to fill the grid with other words without ambiguity was very difficult unless very elaborate details of the shape were given in the preamble which might reveal too much. The fact that there were two Qs in the phrase did not make it any easier. So that idea had to be abandoned in favour of what actually appeared. As the puzzle would be very easy if the Presidents appeared in the grid, the approach adopted was that anagrams of their names would appear in the grid and solvers would be given an instruction that this was required. 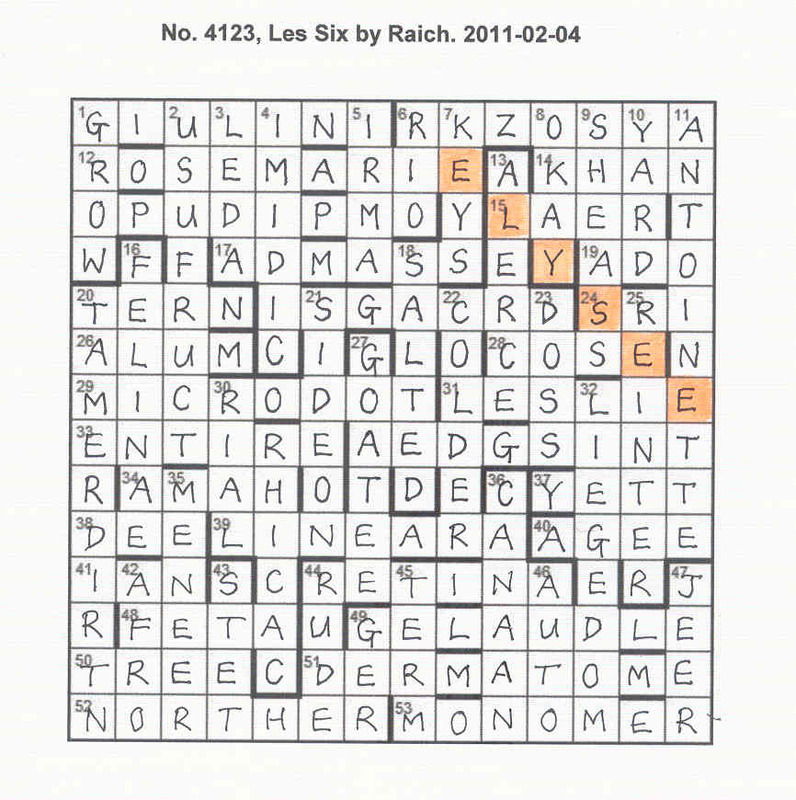 The two earlier Raich puzzles in the Listener series had ‘last steps’ which had turned out be quite difficult so I tried to make the last step in this one a little easier and so plumped for the highlighting of Élysée which in France is used as shorthand for the Presidency. I was just a little concerned that this might not be so familiar to UK solvers so checked this out in advance with a couple of people. The message came back that it was very well-known. The instruction was MÉLANGEZ LES PRÉSIDENTS DE LA CINQUIÈME RÉPUBLIQUE. While the instruction was in French, it was thought this would be very easy to translate with mélange as a mixture appearing in Chambers (though mélangez in the message is the plural form of the imperative verb) and ‘Presidents’ and ‘Republic’ would both be simple to deduce. French numbers are pretty well-known, not least because of Eurovision voting, so again it was considered no major problems should occur with ‘cinquième’. Also that there was no need to refer to the foreign language in the preamble as (1) it might give too much away (2) the title of the puzzle already hinted at ‘Frenchness’. How to present the instruction? In the end, I decided to go for the idea of the message emerging from clues as they were solved. 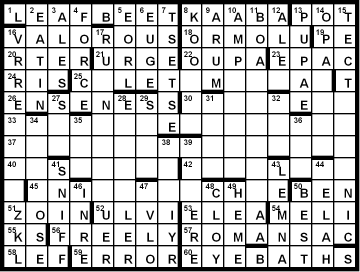 To increase the difficulty level a little in a puzzle like the Listener, I went for two different clue types (A) wordplay having an extra letter and (B) wordplay with one letter missing. The latter are harder to solve than the former and I avoided using them in the case of three-letter answers, the wordplay would then have only two letters. Ideally I tried to have an equal number of each type of clues, but fell just short (by 2 – 24/20 instead of the 22/22 of a 50:50 split). The major constraint that led to this is that in the ‘missing letter’ clues, the relevant letter that appears in the instruction has also to appear in the relevant answer in the grid. Constructing the grid was quite difficult. Having to split one President’s name (GISCARD D’ESTAING) in two meant there were 7 anagrammed entries altogether and ÉLYSÉE also had to be accommodated. In 3 of these anagrams all the letters were different so there could be at most one unchecked letter in the answer – otherwise there would be ambiguity. It took quite some time to get the grid to meet the recommendation in the guide for Listener setters in regard to minimum average word length but I got there in the end. So then the clues had to be written and fingers crossed for President Sarkozy’s well-being as the arrival of a seventh President between submission and publication would have holed the puzzle below the waterline. As you know, he made it. The next presidential election is due in 2012. I commented a week ago that some kind of Listener deity was smiling on us and giving the Scots at CERN living on the Swiss-French border a whole series of crosswords set especially for us. I had expected the series to come to a halt but here we go again. ‘Les Six’ here generally refers to the original six countries of the Common Market, but they didn’t quite fit, – even in their own languages, Deutschland, France, Italia etc. 🙂 – into the unclued lights, so we set to with our solve. This was the evening after the superb party put on at the Spectator’s offices to celebrate the 2000th crossword puzzle and we were miles from home without resources (But without regrets, too – what an impressive gathering of able and charismatic people!). It’s quite a shock to find how much more difficult solving is without the Internet, Anne Bradford’s wonderful Solver’s Dictionary and the large red book but we were travelling hand-luggage class and our efforts on the tube and on airline pop-down trays were mediocre, producing some rather strange letters in the unclued lights (RK?OSYA, A?D?SINT and TAME?DI?TN). We were clearly in French territory as (ROSE)MARIE ANTOINETTE had appeared but I realise now that that was just a stinky red herring dangled in front of us by Raich to distract us from what we suddenly saw intersecting with it! Could RK?OSYA be anyone other than our treasured President, M Sarkozy? His letters were anagrammed or ‘Mélangées’, so we suddenly understood the rather strange French words that had been appearing: MELANGEZ LES PRESIDENTS DE LA CINQUIEME REPUBLIQUE – and we did. DE GAULLE, POMPIDOU, GISCARD D’ESTAING, MITTERRAND and CHIRAC helped us fill those unchecked lights. No problems? Of course we had. We have been living here for a long time but didn’t know how to spell M Mitterrand’s name, and, with only one R, were heading the wrong way down Les Champs Elysées. Then there was the wordplay of what we assumed led to LESLIE ‘Man consistently cut title (European)’. The solution was totally confirmed by checking letters but an entry was in the post before we understood that the title ‘LES SIX’ had to be docked ‘consistently’ thus producing LESI + E(uropean) with that extra L coming from the required extra letter. Thank you, Raich. We thought this was enjoyable and very fair. I can’t say often enough how good it is that every now and then, there is a puzzle that numpty lesser solvers can handle and enjoy. C’est étonnant! En premier il y avait le laboratoire européen pour la physique des particules (CERN) que Shirley peux voir de sa fenêtre! Puis il y avait le drapeau suisse … que Shirley peux sûrement voir de son jardin! Et nous voilà cette semaine avec les six … quoi! Or to put it another way, what’s with all the French? Are we gradually migrating from the Listener to L’auditeur? After all, it was unlikely to be a puzzle about someone called Leslie Six. Perhaps the title was just a bit more devious in its message. Time would tell. This was Raich’s third Listener, the last being OOOOPPPP about Parkinson’s Law which I thoroughly enjoyed, probably because it’s something I experience every day! In the preamble, we were told that 24 extra and 20 missing wordplay letters would give us an instruction. Oh dear, that’s a bit asymmetrical, and I know someone who wouldn’t have been too enamoured of that! Anyway, that left nine normal clues and seven unclued entries; since one of the unclued entries was in two parts, I assumed that made up the Six in the title. Starting on the clues, and it was soon clear to me that this would be a bit of a marathon. OOOOPPPP was at least easy to start with although it slowed down somewhat half way through. (I thought puzzles were supposed to get easier as more letters filled the grid!) No such problem here as the letters filled the grid very slowly from the start. 1ac Musical figure Luigi almost back in Italy (7), and in hindsight I cannot believe that I didn’t get it straight away: GIULINI, not that I’ve ever heard of him, but a simple clue that should have been my first to solve, but wasn’t. That honour should have then gone to Prince, shaken, first to leave liquid (4), but again, didn’t. I was trying to make an anagram of (P)RINCE minus a letter, despite being unhappy with the word losing a letter after being shaken. (The answer turned out later to be KHAN, liquid being the anagram indicator of (S)HAK[E]N.) 14, 15 and 17 also got left unsolved, and it fell to the puny 3-lettered ADO at 19ac to be entered first in my grid. What an atrocious start! 24ac SRI next, another puny entry, and I’ll give you two guesses which was my next: no, not DEE[R] at 38ac, but IAN at 41! This was followed by the slightly more substantial 48ac FETA and 50ac TREE. I’m not really sure why I was making hard work of this. 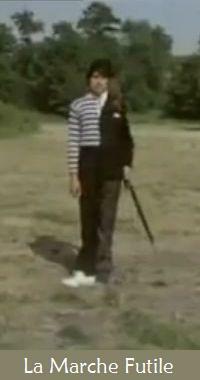 Maybe it was having three different clue types; I think I’ve said before that my brain can normally only juggle two. Either extra letters or missing letters on their own can be quite tricky, and of the two, I think the latter are the worse because it is always better to be given too much information (letters) than not enough. For example: Amateur thespian’s opening with old drama (4) gives A[U]TO — A + T + O. I’m not having a pop at Raich here, just giving a reason why I made such slow progress. Of their type the clues were all perfectly fair. Mélangez les présidents de la cinquième Republique. plain Nicolas SARKOZY, but born Nicolas Paul Stéphane Sarközy de Nagy-Bocsa!! LE(S) [L] SI(X) (the title of the puzzle!) + E (European); so Leslie does make an appearance after all!! 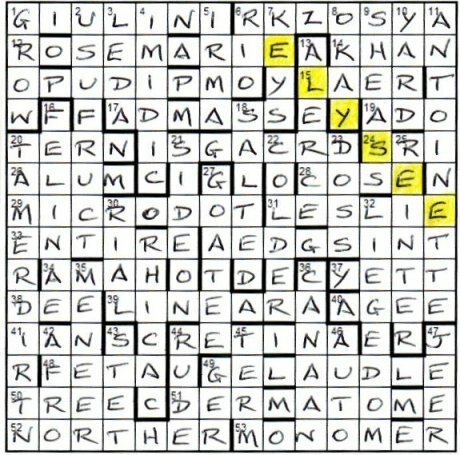 The thematic location that needed highlighting was obviously going to be ELYSEE, and it didn’t take more than a few seconds to find it in a NW-SE diagonal near the top-right corner of the completed grid. So, another good puzzle from Raich, and hopefully the last with strong European overtones for some time! Dirty minds, all of you. The above is not uncommon here in New Zealand, though I’m quite good at not noticing earthquakes. But there have been one or two that even I had to consider undeniable. And the other half – she’s the earthquake sensitive one – slept through the big quake in Christchurch last year, while I lurched awake, and made a mental note to check whether there had been an earthquake at what the level of daylight (I couldn’t see a clock) suggested was about 0430. Not bad: it actually occurred at 0435. But once I started thinking about earthquakes, and also embarked on reading a book on NZ geology, then it seemed there was a puzzle in there. The concept of sliding motion between tectonic plates was in at the outset. In fact, the idea of vertical sliding was in at the outset, since the faultline in NZ is (very) roughly N-S – I was interested to see one of the editors think that the grid might have been fairer had the slipping been horizontal. That was never really an option, in my mind. There followed what, for me, was a large amount of scribbling on paper trying to get some grids to work. 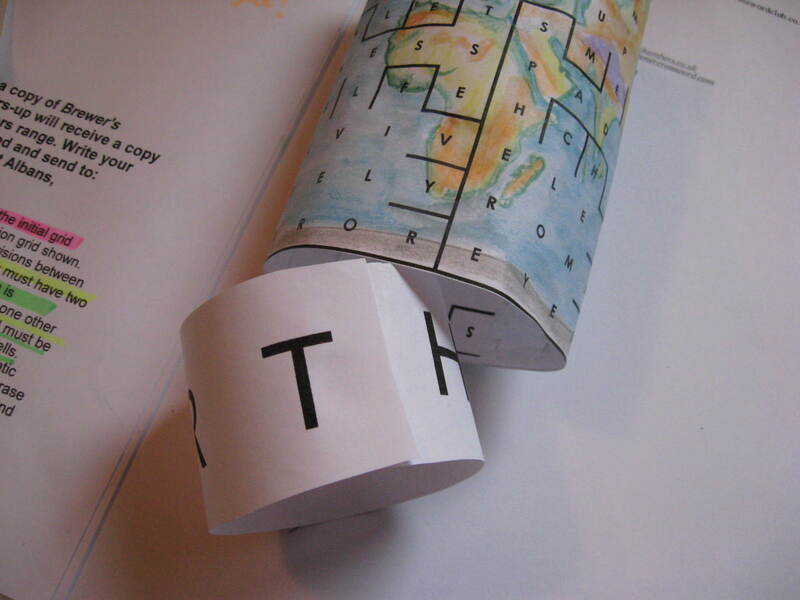 The original plan was that two adjacent columns would slide together, creating new words all the way down the faultline. This was clearly unworkable, though I obdurately pressed on for about four failed diagrams too many. I suspect it might be possible, but I wanted the final grid to contain and/or retain thematic material, and the words I’d come up with just wouldn’t play ball. Then the idea of letters sliding down within a single column occurred to me, and that grid fell out quickly. It also brought with it the idea of a Carte Blanche grid that didn’t actually fit the presented square in its original formulation, and that seemed a new concept. I settled on FAULTLINE down the middle (which, when combined with TECTONICS threw up a coincidental NZ in the pairings), and went for MERCALLI SCALE simply because it had an odd number of letters. With a central column, RICHTER SCALE would have been offset and, despite all the recent muttering about whether symmetry adds anything, I suspect that would have thrown quite a few people. (The NZ Geonet people use Modified Mercalli rather than Richter to measure local quakes, anyway. Here’s yesterday’s (which I missed) at GeoNet New Zealand.) I looked up PLATE in Chambers, and it had a wonderful range of definitions, and the idea of including these ‘redundantly’ in clues was born. The idea felt sufficient of a novelty that I employed a tester. I’m in two minds about testers, ever since I tried two testers out on one puzzle, and got such contradictory responses that I ignored both. But this idea felt like it needed to be run past someone, and so it was sent off. The tester solved it, though not without some detours, and while I was interested in these vagaries, I didn’t in the end make a great deal of changes. He did spot, and get slightly distracted by, the transitive verb ‘to heart’ which I hadn’t even considered, but it’s another nice coincidence. The editors accepted it without asking me for rewrites (though they made some themselves – always tempting, therefore, to say that any clue you disliked wasn’t my doing…). 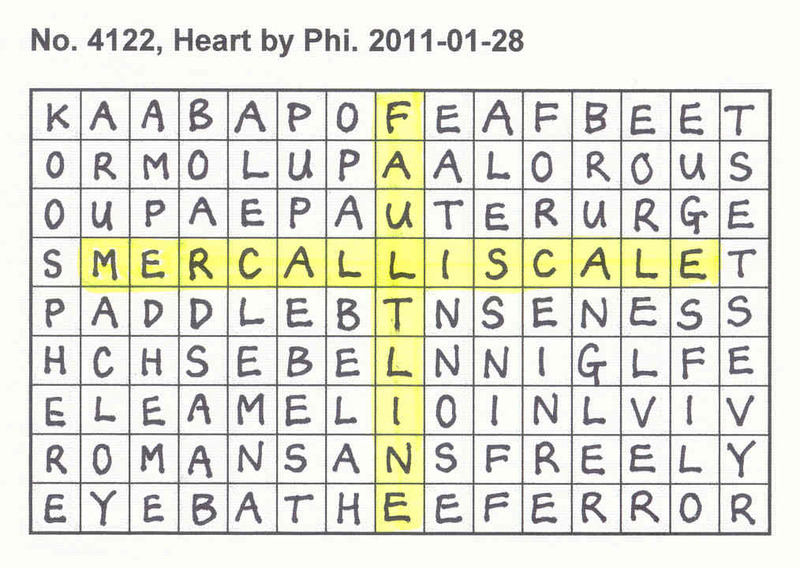 They found that my first answer was one of Chambers’ treacherously absent cross-references; I’d never noticed this, having filled the grid interactively with Sympathy, and happening to clue the word also at the computer. By the way, the veg in question is called SILVERBEET in NZ (see ODE) (our neighbour has it growing wild in his garden). A neat indication of the perils of electronic dictionaries – but that’s the reason for the warning in the preamble that seems to have misled some. The puzzle predates the 2010 Christchurch earthquake by some margin – the actual one that set me thinking was in 2007, just before Christmas. There is, obviously, always the chance that the puzzle could appear just as a major incident hits. Indeed, the proofs arrived fairly close to one of Christchurch’s larger aftershocks on Boxing Day, which had me looking slightly askance. But if you cancelled things because something they contained might possibly be caught up in events, then you’d never publish anything. Phi, hmm! We can expect a challenge. We didn’t have a Phi last year, did we? The last one was 50-50. A grid with no bars. Double hmmm. No down clues. No clue lengths. This is a challenge. We start cold-solving and Phi’s careful cluing leads us to our self-imposed Friday’s twenty solutions and our first breakthrough. SILVER must be the extra word in 30 ‘Silver ring attached to friend’s jewel’ OPAL. My essential Bradford is inches away and confirms that PLATE is a common factor. We are having a run of lucky guesses this year and numpty no. 1 says, “I bet it’s plate tectonics – look at the title. HEART. Does the earth move for you?” And so we go to bed. Morning sees us attempting to fit our 35 solutions into a grid. We have spotted a pattern in what must become the across clues, with POT-VALOROUS matching ROMANS A CLEF. in that area of wreckage? (We had been expecting some sort of Bermuda Triangle!). 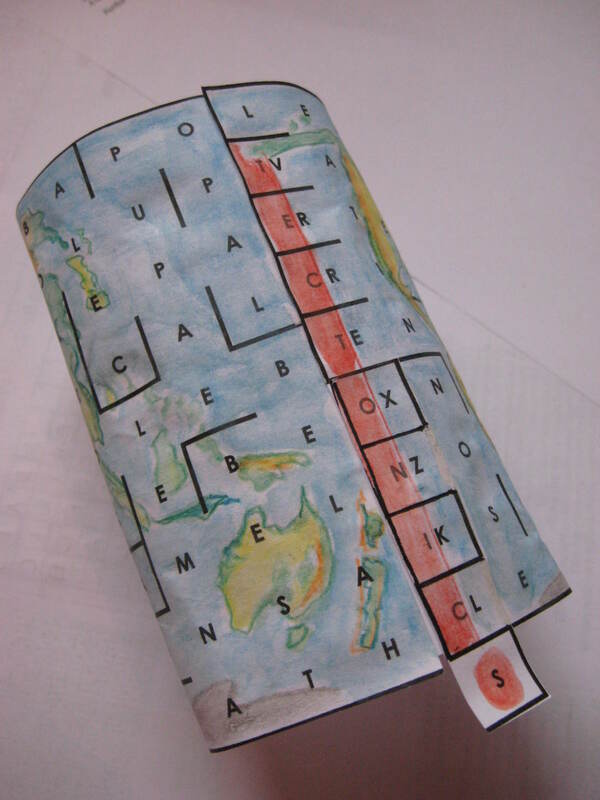 We move our TECTONIC to the left by squeezing its letters into single cells, so that we have fulfilled the requirement of having TECTONICS as the first letters of the ‘pairs in single cells’ and we have our PLATE TECTONIC(S). The S must come from end of the final row. Adding those pairs of letters together produces a most unsatisfactory set of letters (EHTMIMAQW). A bit of head-scratching ensues, then we realize that this is where we have to operate our earthquake. We shift that column up and, hey presto, the maths work! LT = F, EV = A, CR = U, TR = L, OE = T, NX = L and so on. We have a FAULT LINE. It doesn’t take a genius to see that it has to go into the middle of the grid to put that missing L into the middle of MERCALLI SCALE. one merits a bit of coloured illustration so I get my pencils out and produce a rather odd projection. Meanwhile, Numpty number two demonstrates how that brilliant title has to do the same performance of converting itself into a cylinder, so that HEART moves to EARTH. I remember Erwinch saying in an LWO blog that if you are not sure that you have solved the Listener crossword, then you almost certainly haven’t. That was what was so satisfying about that final revelation. It left no doubt about which (both) items were to be highlighted. A superb piece of compiling. Thank you Phi!